The latest teaser hints that the upcoming smartphone will be an online first smartphone. OnePlus is gearing up to launch its next-generation of the flagship device, the OnePlus 6. The company has been teasing the smartphone for a while now and the latest teaser hints that the upcoming smartphone will be an online first smartphone. As per an advertisement being shown at cinemas hall in India and it reveals that the smartphone will be exclusively available on Amazon. This not a surprise as all previous OnePlus models were exclusively available on the e-commerce portal. 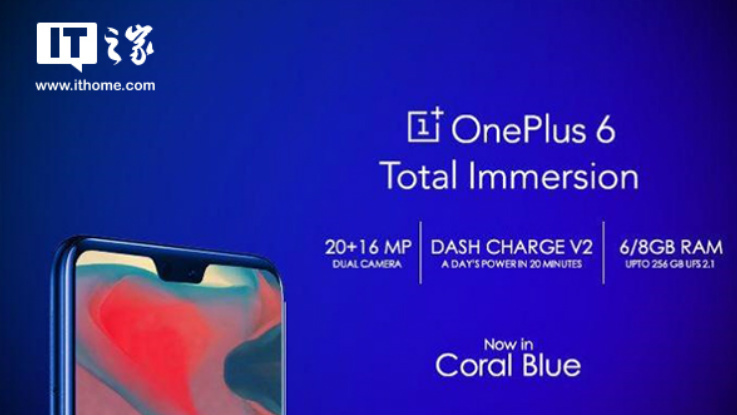 Further, the new promotional poster has appeared online revealing new Coral Blue colour option for the OnePlus 6. The poster (via ITHome) also reveals some key specifications of the upcoming smartphone. Firstly, the OnePlus 6 will be backed by dual rear cameras that will come with a combination of 20-megapixel primary lens and 16-megapixel of secondary sensor. The OnePlus 6 will be 6GB/8GB of RAM and it will be backed up by up to 256GB of UFS 2.1 storage. Further, the latest smartphone will feature Dash Charge V2, which the brand claims will a day’s power within 20 minutes of charging. The brand has already revealed that the OnePlus 6 will feature a massive 256GB of internal storage, making it company’s first phone to bear such large storage. Lau also confirmed that the phone will be backed by an 8GB of RAM. Under the hood, the smartphone will be powered by the latest Qualcomm Snapdragon 845 processor. OnePlus has already confirmed that the upcoming smartphone will sport an iPhone X-like notch on the top. The brand has stressed that the notch present in its upcoming smartphone is different, ‘implemented with more thought and care’.